It’s time to put together that gift shopping list for your business or family. Imagine how easy it would be to be able to compile the list online through your computer. Then, having this all in one place, you could easily print the list out to bring with you while shopping for your gifts. It turns out this gift shopping list is available now. This new Gift Shopping List Template does all this and more. Shopping list template has been created in Microsoft Word 2007 and can be customized to work with any newer version of Microsoft Word®. Gift list template is simple and neat, yet has a space for all of the needed information. Plus, using Microsoft Word you can customize the fonts, colors or size of the list can be adjusted when producing your list and during printing process. The gift list template includes a row for checking off gifts that have been purchased, a space for the name of the recipient, the gift chosen, gift location or store, and other options to check if the gift is wrapped, and shipped. This list can be used to separate the same gifts into different colors for each department or work group. Each gift can be checked off the list once it is purchased. This makes sure no gift will be purchased twice. An updated gift list template can be printed any time and as many times as needed to finish procuring all of your gifts. Plus, you will save time by not having to remake this list over and over. Titles of the columns can be changed to fit your needs. For example, size could be changed to department. 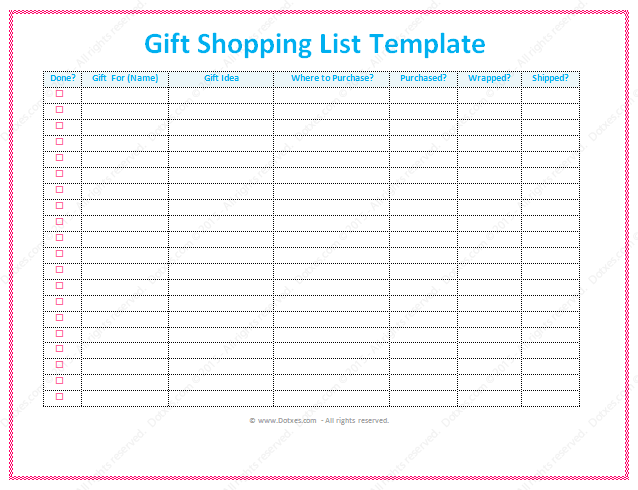 Clearly, this template is easy to use and quite effective to organize your gift lists. You can customize and use this list template no matter you need a gift list for wedding gifts, Christmas or any other event you’ll find this simple template helpful….